EUROHOUSE at Summerhall, Edinburgh. Photo: The Other Richard. Nasi and Bert live together in the Eurohouse. Nasi is Greek, Bert is French. They’re best friends. They’re allies. They’re equals. Or so it seems at first. 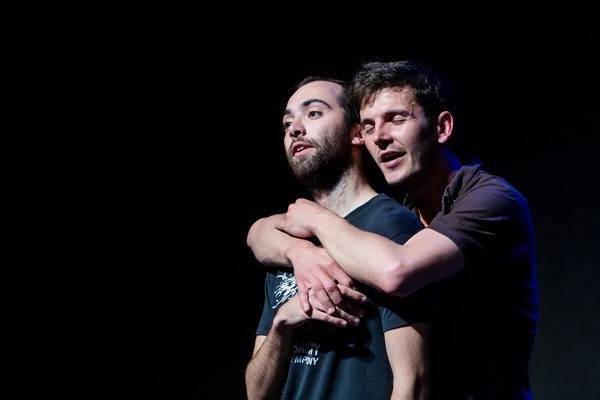 EUROHOUSE is an poignant and sharp response to the European Union, created and performed by Bertrand Lesca and Nasi Voutsas. Mostly, it deals with the relationship between the Union and Greece, through simple staging and a series of vignettes interspersed with funny dances and clown routines. These alter Bert and Nasi’s relationship throughout the piece, and guide the audience gently towards some uncomfortable truths. The performers’ approach is warm and unpretentious; their interactions with the audience are always very natural. With a 10am start time, they wake us up and ease us in with a bit of gentle participation: we all hold hands and break the ice. “We have a dream,” Bert tells us, speaking for both him and Nasi, who is up on his shoulders. He goes on to describe the dream. Everyone’s in white. There’s a paper boat, a small boy and a marching band; a vision which recurs throughout and builds towards a final, shattering effect (which I won’t spoil). They dance this wonderful, cheesy dance full of lifts and soaring around the space like eagles. They support and boost one another, and have fun, together, as friends. Bert is eating M&Ms. He has lots but Nasi has none. Bert decides to share. Nasi takes a packet gratefully at Bert’s behest. A bit later in the show Bert wants them back though, “Where are they?” he asks. “I ate them,” replies Nasi. The show takes an unprecedented turn as Bert fetches a bucket to force Nasi to be sick into. Of course it’s an obvious analogy for the notion of debt but at the same time the change in Bert’s character is subtle and unsettling. The cosiness of the Eurohouse soon begins to looks like an illusion. Lesca and Voutsas are the perfect double-act. Lesca’s character is understated and disturbing, as throughout the show he gains increasing control over his friend, bullying and coercing him until he finally breaks. Voutsas is a wonderful counterpoint to this, playing the trodden-down, often gullible figure with a heart-breaking naivety. And both are fantastic comic performers, with great timing and a penchant for the absurd. EUROHOUSE isn’t directly a play about politics; it doesn’t discuss the EU in an overt way. And it doesn’t mention Brexit, thank god. Through its characterful comedy, however, it creates a very human and emotive look at power, and ends with some startling facts: fifty-two percent of young Greeks are unemployed, the suicide rate in the last few years has increased dramatically and Greece continues to be crippled by a spiral of debt and subjection. This is a powerful, important and subtle piece of theatre which might well make you rethink the EU – and, even if it doesn’t, it will definitely make you laugh.